Want All the Comforts of Home? 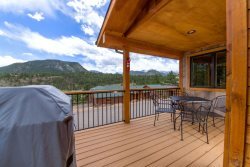 Our property boasts all the desired amenities of the ideal places to stay in Estes Park: walking distance to town, community outdoor heated pool and hot tub, fishing in Fall River, and outdoor recreation area with hammock, grills, fire pits, and yard games! Our condos are fully-equipped; providing modern decor, a mountain cabin feel, mountain views, and comforts that keep guests coming back, trip after trip! What Do We Mean by Fully-Equipped? There are many places to stay in Estes Park. For a condo with everything you need, look no further! Here is exactly what each condo comes stocked with and common items to bring for your stay. Each of these items should be found in your condo at the beginning and end of your stay. Safeway nearby or the local grocery store can also meet your needs.